‘Keep any food out of sight, otherwise she will climb down the tree to take it from you!’ exclaimed our guide. 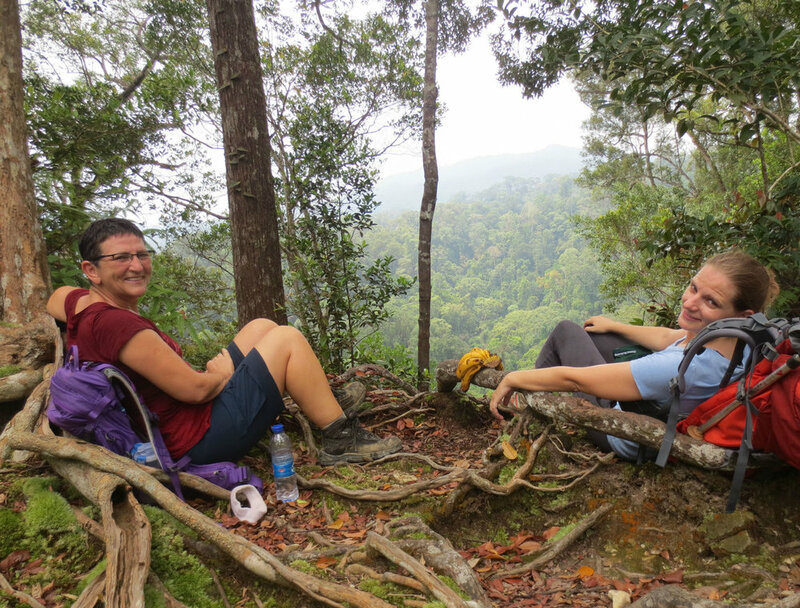 In the jungles of northern Sumatra the last remaining apes are living in their natural habitat and Francien, Marcella and myself started on a three day trek through this remote part of Indonesia. 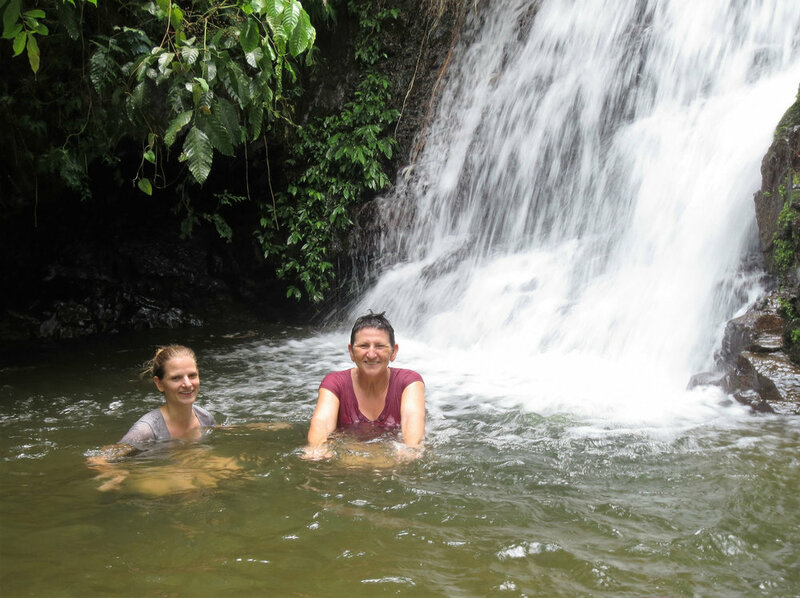 We left the village of Bukit Lawang together with our two friendly guides Kinol and Yadi via a rope bridge with cracked wooden slats to walk on, into the forest. Humid air closed around us and the sights and sounds of the village were quickly lost.The vegetation was lush and continuous. 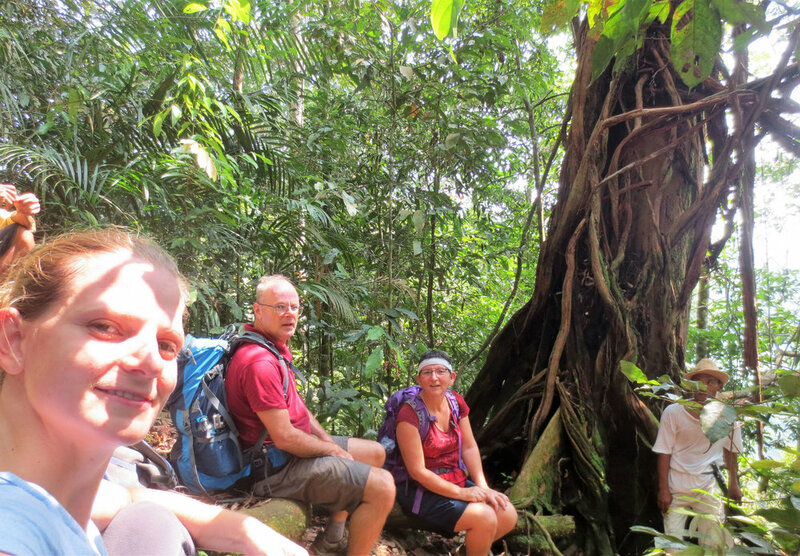 This was primary rainforest where the trees form a canopy up to 30 meters above the ground. The path was so narrow that we only could walk in a single file, up and down forty-five to sixty degrees slopes. The ground was rain spattered, strewn with leaves, uneven littered with loose rocks and stones making it slippery. We balanced our way on tree roots, climbing over fallen tree trunks, sometimes crawling on all fours. 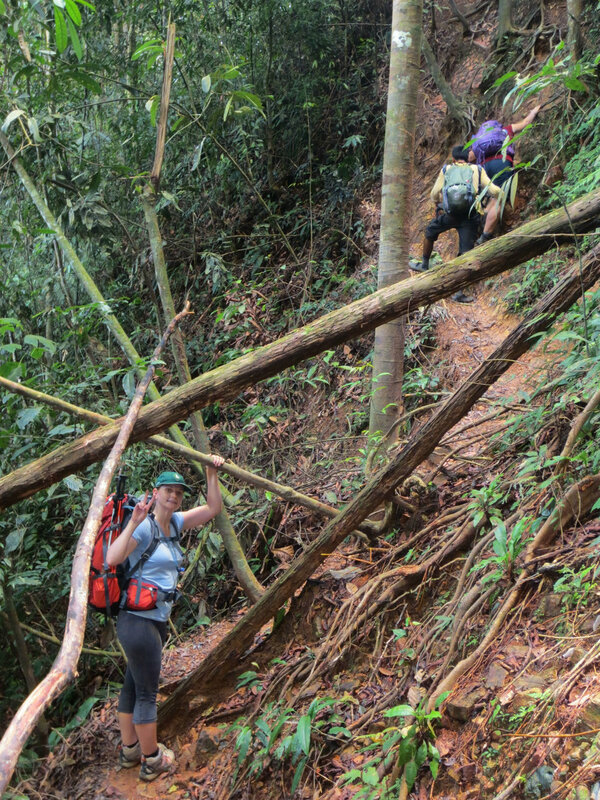 When going downhill, we needed to concentrate not losing our footing on the muddy slippery path, sometimes using lianas to hold onto. A fun challenge, certainly not for the faint-hearted! At times the forest was so dense that when leaving a gap more than ten meters between us, we could not see each other anymore. Reaching a sunny clearing, we sat down and drank water which we carried in our backpacks. Yadi cut fresh pineapples with his machete for us to snack on. It was great to hear the birdsongs, the squawking of hornbills and the hooting call of gibbons, but their camouflage made them invisible to our untrained eyes. All of the sudden the rustling in the tree-tops ……. Above us an orangutan mother and her baby. 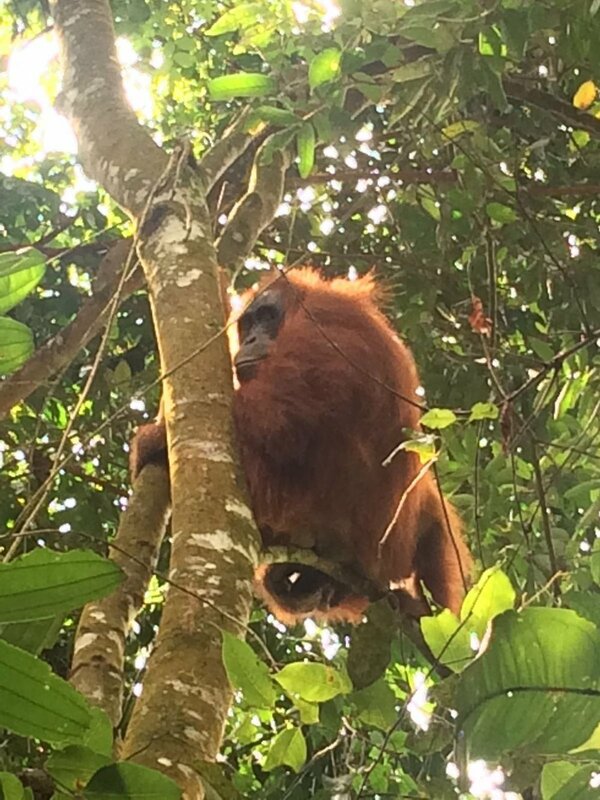 We sat down and gazed at these hairy reddish-brown apes, as big as an adult human being, hanging high in the trees. They moved slowly and looked straight into our eyes as if they recognised us! The mother was foraging while breastfeeding her baby, keeping an eye on us. As soon as the baby had enough, the mother continued to gently built her nest with leafy branches she pulled from the trees. In this nest she would sleep at night together with her baby. A surreal feeling being so close to these endangered animals. It was difficult to make pictures due to the thick vegetation and sunrays shining down through the foliage. After staying with this mother and her infant for twenty minutes, we donned our rucksacks and continued the trek. When we climbed down the last steep hill into our overnight camp another orangutan mother and her baby hung high in the canopy staring at us. We stopped. Using her long arms (the arms stretch longer than their bodies) she swung between the branches, down the fifteen meters high tree. Within a few seconds she strongly, yet gently grabbed the rucksack of one of the guides who had put himself between us and the ape, searching for food. Only a bunch of banana’s made her climb back into the tree again, giving us enough time to pass and gain enough distance to watch her. ‘As soon as she has finished these banana’s we have to leave here, because she will want more!’ Kinol said and we happily followed his advice. Woow, awesome to see this ape standing as tall as Kinol and Yadi! We felt not frightened, but certainly intimidated. 'This particular animal has been saved by the nearby orangutan rehabilitation centre and therefore is used to humans', Kinol explained. Cleverly she knew we carried food in our rucksacks! In three days we encountered five solitary mothers with their baby’s. Seeing these gentle apes straight into their eyes is like looking another human being in the eyes. A humbling and peaceful experience in such a primeval environment! When we reached our camps in the afternoon, we tugged off our sweaty wet cloth and enjoyed the crystal clear river. The scent of wood-smoke hung heavy in the humid evening air. A group of Thomas-Leaf monkeys waited for their chance to grab food from the camp, a two meter long varan scavenging for anything eatable. Hendri the cook boiled our drinking water and prepared the meals. We huddle around the food, crouching down on a groundsheet to eat. After an exciting day trekking, the chicken-rendang, vegetable curries with fresh pineapples, mandarins and passion fruits made a delicious dinner. Sitting in front of our shelters staring into the dark jungle I listened to the mesmerizing sounds of chirping cicades, rustle of the leaves and the river flowing. Fireflies darted in the star spangled sky and bats hunted for insects. Visions of safari’s we have done in the African bushveld ran through my mind. One evening the heavens opened and the rain pelted down onto our plastic sheeted roof which was leaking thanks to the long-tail macaques who had jumped on it. The campsite turned into a river of mud. We slept on rather unforgiving mats on top of wooden slats, my back felt sore and numb. Much to our surprise: no mosquitos at night at all!! 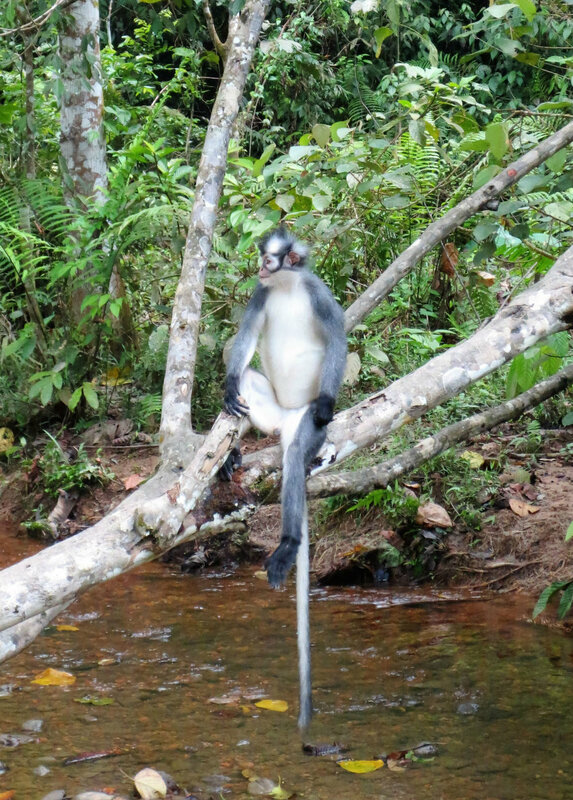 Every morning I woke up to the sound of the river, long tail macaques encircling the campsite trying to grab anything eatable, an animal squealing somewhere deep in the forest. The early sun was already very strong and we washed ourselves in the refreshing river water, ready for another exciting and adventurous walk. On the last day we were spoiled with a river raft back to the village were a SUV was waiting to take us to the Medan airport, a mere four-hour bumpy ride. 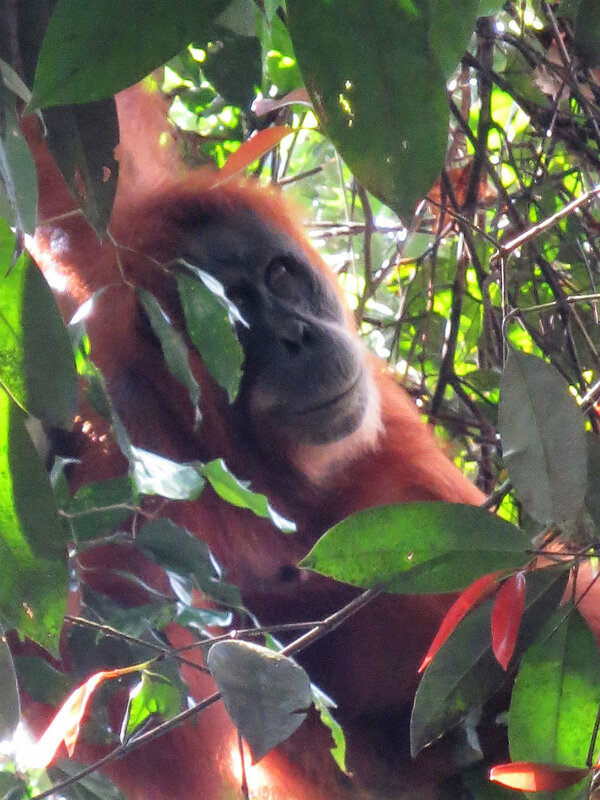 Francien, Marcella and I felt privileged to see some of the last remaining orangutans living in the wild. It was the highlight of our trek. This jungle had a calming effect on us. Unfortunately it was time for us to go back to our own jungle, a busy concrete jungle called Kuala Lumpur. Newer PostExiting full-time employment – what was it like? Older PostDecending into a crater in Indonesia - most inhospitable place on earth!